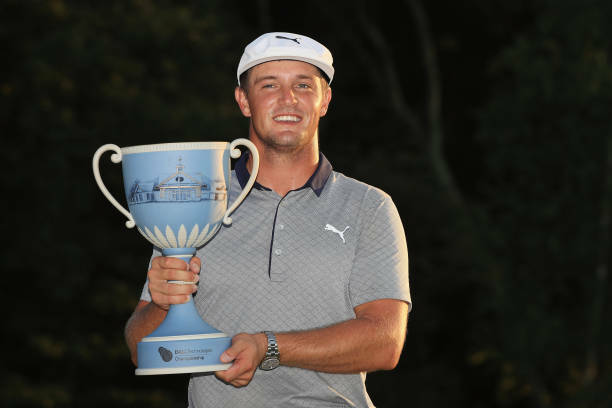 Bryson DeChambeau won the 2018 Dell Technologies Championship by two strokes over Justin Rose. Thereby winning two times in a row. DeChambeau is the only player in the field using a set of matched clubs. He will also be the only player in the Ryder cup playing a set of clubs scientifically matched. Anything we can learn from that? The first thing one should conclude is that it makes sense to play with clubs that are matched so that you can apply the same consistent swing to all your clubs. This can never be achieved with a set of clubs matched by Swingweight. Every golfer needs to understand that Swingweight serves no purpose. It is now being used in a way that the inventor never intended. Every player on the PGA Tour, except Bryson DeChambeau, is suffering from it. There are disadvantages, as well as advantages, of having all the clubs the same length. When all your clubs have the same mass, moment of inertia, and length you can apply the same consistent swing to all your clubs. Being able to use the same swing for all your clubs is a huge advantage. However, your "shorter" clubs will be less accurate, and your "longer" clubs will have a lower than optimal ball flight as compared to a standard set of club. BioMatch gives you the best of both worlds. You keep your standard length clubs while still being able to apply the same swing to all your clubs. And I mean all your clubs, not just your irons, as is the case with the single length irons. The current success of single length irons proves that there is a need for matching of golf clubs. BioMatch fills this need without the golfer having to buy new clubs, and it does so for all the clubs in the bag. BioMatch gives you deadly accuracy with every club in the bag. BioMatch is easily applied to your existing clubs by installing the recommended size of weight to the grip end of your clubs. The patented BioMatch application builds a model of your body swinging each of your clubs. Thereby, determining the optimum weight to be added to each of your clubs for your body, hands, and clubhead to be synchronized at impact. Your game will improve, effortlessly, once you have installed the weights. Bryson DeChambeau's single length irons are all matched. The BioMatch method of matching golf clubs determines the optimum mass of each club in the set. The optimum mass is a function of club length, club moment of inertia, and lie angle as well as the properties of the golfer. As all these variables are identical for all of Bryson DeChambeau's irons, the BioMatch method will yield the same optimum weight for all his irons. As all his irons do have the same weight, they are matched according to the BioMatch method.